The School of Business announces the Howard F. Rudd, Jr., Distinguished Faculty Award for Service Leadership to honor the legacy of Dr. Howard F. Rudd, Jr., Dean Emeritus and professor of management, who is retiring at the end of this semester after 29 years at the College of Charleston. The prestigious award, the first of its kind for the College community, was established to recognize outstanding, high-performing business professors who lead in Rudd’s spirit and example to advance the mission and global vision of the School of Business. The $250K endowed award is made possible by philanthropic gifts from Anita Zucker, chairperson and CEO of the InterTech Group, and Justin R. McLain ‘98, executive chairman of Endeavor and managing member at Duart Mull. Both Zucker and McLain are members of the School of Business Board of Governors. Investing in business faculty is a high priority for Alan T. Shao, dean of the School of Business. The endowed Howard F. Rudd, Jr., Distinguished Faculty Award will annually recognize one business professor by providing each recipient with $10,000 of funding for use in research, curriculum and program enhancements, or professional development. A special committee will be appointed to select each year’s recipient. Minimum requirements for consideration are that each candidate must “exceed expectations” in all applicable annual review categories. “I am extremely grateful to Anita and Justin for their leadership in stepping forward to make this award a reality. Our faculty and students will benefit greatly from their generosity,” says Shao. For nearly three decades, Rudd’s iconic leadership has left a lasting footprint in the 242-year history of the College of Charleston, most notably as the founding dean of the School of Business and Economics in 1986. His commitment to service and excellence in teaching has inspired thousands of College of Charleston students who evolved in his leadership, management, and business policy courses into becoming proud alumni and productive, prosperous leaders in companies and organizations worldwide. 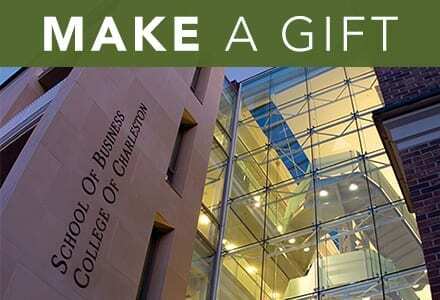 College of Charleston’s School of Business offers seven undergraduate majors, several interdisciplinary concentrations, an honors program in business, an M.S. in accountancy and an MBA. Approximately 1800 undergraduate and graduate students attend from as far away as China, Germany and Brazil. The faculty has research expertise in areas such as global logistics, hospitality and tourism, political economics, financial investment, bankruptcy, business intelligence, real estate, and sustainable business practices. Visit http://sb.cofc.edu/to learn more about our students’ achievements, undergraduate and graduate programs, faculty, and Centers of Excellence.